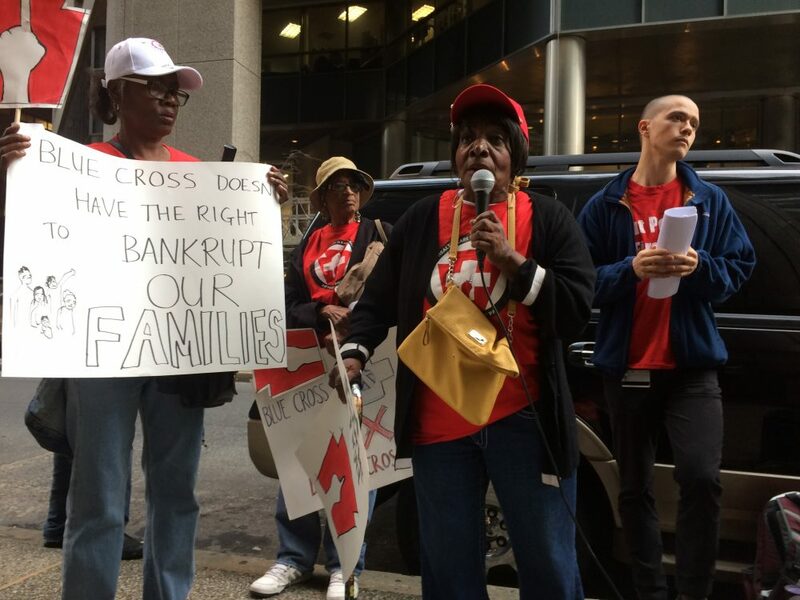 On November 3, dozens of Philadelphians demonstrated outside the corporate headquarters of Independence Blue Cross at the height of rush hour traffic in Center City to speak out against rising Affordable Care Act premium rates that are impacting residents across Pennsylvania. Members of grassroots organization Put People First! PA were joined by union allies from the SEIU Home Care Workers Union and Pennsylvania Federation BMW-ED. “Healthcare costs – they’re affecting everyone. This is what our brothers and sisters at [SEPTA Union] TWU Local 234 are fighting for,” said Robert Fields, of Southwest Philadelphia. Looming above the crowd was a 12-foot puppet of Independence Blue Cross CEO Daniel Hilferty, who makes $4 million dollars a year. 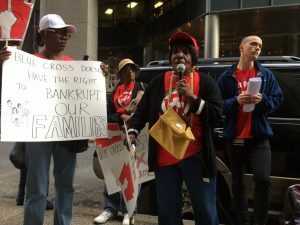 With this as the backdrop, members and friends of Put People First spoke to the impact that rising premium was having on their ability to pay for basic necessities. Communities all across Pennsylvania are faced with an average increase of 32.5% for ACA individual plans. IBX asked for permission to increase their rates by 19.87%, and instead were approved for 27.97%, 40% more than they asked for. In a recent survey conducted by Put People First! PA, which included Pennsylvania residents from over 40 counties, more than 1 in 3 said that in the last 12 months healthcare costs forced them to skip paying for basics like electricity and groceries.